White OLEDs have the potential to offer significant performance advances to the general lighting arena. Since Edison’s development in 1879, its energy efficiency of the incandescent light bulb has not improved beyond 4% — equivalent to about 12 lumens/Watt (lm/W). Consequently, incandescent light bulbs are losing favor here in the U.S. and around the world. In fact, plans are underway to ban and/or phase them out altogether. Fluorescent tubes, capable of up to 120 lm/W, but typically in the 70-100 lm/W range, offer color qualities that are undesirable for many applications. They also present numerous environmental and disposal issues because they contain mercury. UniversalWOLED™ OLED lighting has the potential to reach more than 150 lm/W. We believe that OLEDs offer significant energy savings and environmental benefits to end users around the world. With lighting accounting for 15% of global electricity consumption and 5% of worldwide greenhouse gas emissions, WOLEDs could have real impact on reducing energy consumption. 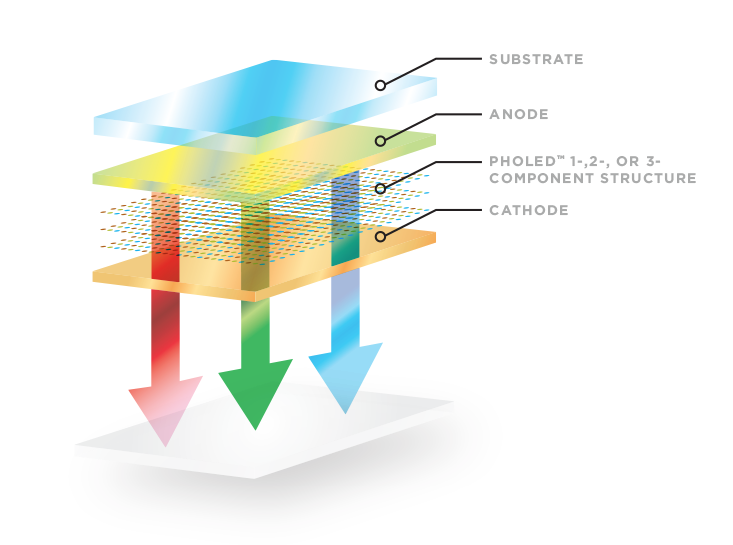 In the solid-state lighting realm, OLEDs and LEDs are complementary. OLEDs are excellent surface lights, while LEDs are bright point light sources. As noted by the U.S. DOE, OLEDs can be configured as larger-area, more diffuse light sources, which may be more practical for general ambient lighting because the soft light can be viewed directly, with less need for shades, diffusers, lenses, louvers, or parabolic shells. Since OLEDs can be very thin, they are more appealing, and can easily attach to wall surfaces and ceilings. This, coupled with the diffuse nature of OLED lighting, can enable an entirely new type of light and light fixture that’s both attractive and highly efficient. OLEDs can also be made in almost any shape, can be deposited on flexible substrates, and can be transparent, emitting light from both sides of the device—features that greatly expand the design possibilities, allowing for a completely new lighting experience.